If you want the extra support a well-bolstered seat offers but don’t have the cash to spend on expensive racing buckets, this modification may tide you over for a while. Note the zippers exposed in the first picture. These are buried inside the back rest of the seat. 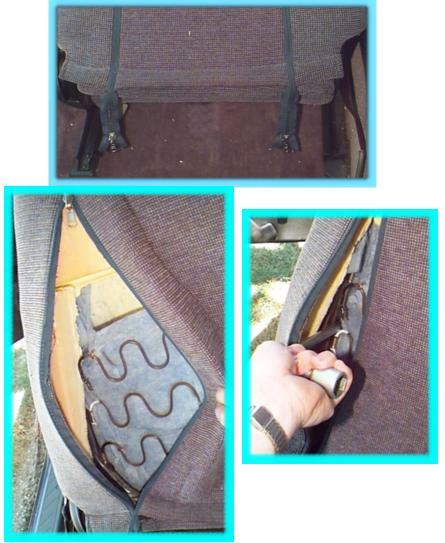 I was able to expose them without removing the “hog ring” clips that hold the upholstery on the frame. once exposed, unzip them. In the second picture, three springs are visible. I removed the top one because I felt the lumbar support extended too high. This also allowed me to sit further into the seat and benefit from the increase in bolster. The spring is tough to remove but don’t cut it (I don’t like to burn bridges behind me). I used a pair of pliers to hold the spring then struck them upward using a hammer. I only removed one side of this spring. At first I removed the top two springs but replaced the middle because I was uncomfortable. If you slide your hand into the back around the outer edge, you can feel the bar that provides the bolster support of the seat. Be CAREFUL Nissan didn’t know you would do this so some of the metal in there has jagged edges that may cut you. I used a large pry bar to move this bar closer to my sides. (the tire iron is for illustrative purposes). You will be amazed how much a little does so don’t go nuts all at once. I moved the bar about a quarter of an inch at a time. The bar was resting on the middle spring and prying on the frame from the inside and the bolster bar from the outside. Have a seat. Make sure the sides are even, and not too tight. Notice the seat no longer pushes you off the back rest.